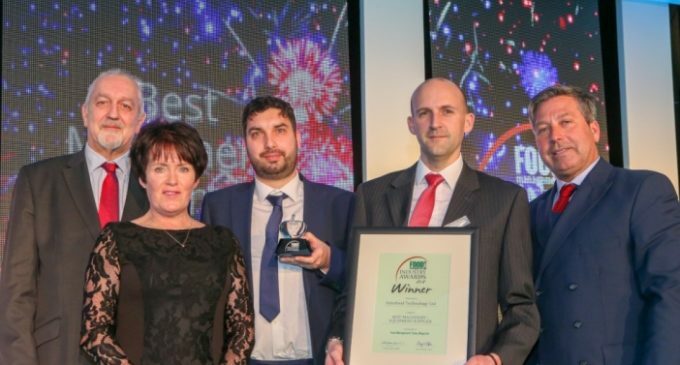 Interfood Technology has scooped its second award in less than a year with the presentation of the ‘Best Equipment/Machinery Supplier’ at the 2018 Food Management Today Industry Awards. The Awards, designed to celebrate the creativity, innovation and excellence of the British food industry, took place recently at the Royal Garden Hotel in London. Interfood won one of 16 hotly contested categories, with representatives from the Interfood team receiving their award from chef and TV broadcaster John Torode, watched by around 300 guests assembled for the celebratory lunch. The last year has been a big one for Interfood, seeing the company relocate its UK base to a new site some four times larger than its previous home. This decision was taken to allow the business to continue to develop and expand in its role of supplying innovative solutions to its customers throughout the UK and Ireland. In addition to industry experts, the Awards’ entries are voted for by the readers of ‘Food Management Today’ magazine so are an excellent representation of those who work throughout the food processing industry who understand the vital role played by the equipment employed to produce the nation’s food. The ‘Best Equipment/Machinery Supplier’ category is presented in partnership with The Danish Agriculture & Food Council (DAFC) and Rob Smith of the DAFC was on hand to co-present the Award with John Torode. Pictured (L-R): Rob Smith of DAFC, Mary Cannon, Lee Payne and Richard Fogg of Interfood Technology, and chef John Torode.